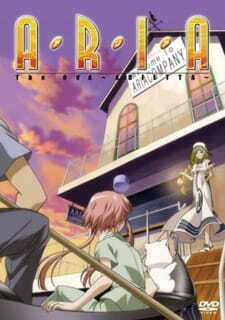 Aria the OVA: Arietta is considered to be an "extra" story that describes the past of Aria Company before the arrival of Akari. Akari has a dream one night where she became a Prima after Alicia leaves the company. Waking up feeling extremely melancholy, she questions why Alicia chose her as her disciple. Alicia takes Akari down memory lane, and tells Akari a heartwarming story of teenage angst, friendship and courage. It is no secret. If you have finished Aria the Animation and Aria the Natural, you would want to finish off the entire series. Once again Aria the OVA: Arietta is relaxing, peaceful, and slow-paced. Is this OVA any different from the prequels? Not really. This can be considered a "special" episode that describes more of the background between Akari and Alicia. It is such a wonderful and emotional experience to watch how Akira came to be at Aria Company and her her personality affected Alicia in many ways including showing her the wonders of Neo Venezia. Simply put, this is another well compiled anime to enjoy. As per usual, the art is really well done with fine details on characters and backgrounds. The city of Neo Venezia never ceases to bore me as the anime seldomly repeats locations on screen so we do not expect what will happen next. We also got to see Alicia when she was young! The theme songs were nice and complemented the anime very well. The voice acting was once again perfect and the ambient sounds were abundant throughout this OVA. Nothing to complain here. The OVA solely focuses on Akari and Alice's relationship with each other. We get to explore the background history of Akari and how Alicia came to take care of her. The other characters played some minor roles here. Overall, I would say that this short OVA was quite emotional and enjoyable to watch. It explains a lot of background information that was not properly explained or shown in the prequels. You will continue to enjoy the city of Neo Venezia and come to understand the characters even more. The story here is basically explain the events of Aria Company before Akari came along. Theme songs were nice and voice acting was perfect. More character development of Akari and Alicia. Enjoyable like drinking hot chocolate on a cold night. It was a emotional OVA that complements the main series.